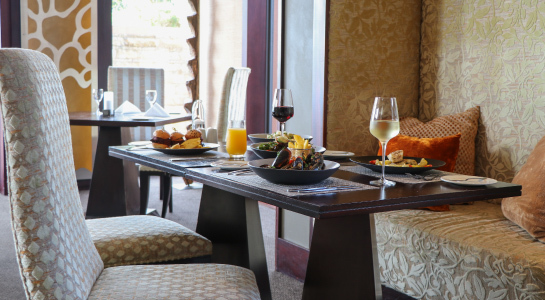 From casual cuisine at the relaxed Zachary’s Bistro, to liquid perfection at Noah’s Champagne and Cocktail Lounge - guests are conveniently offered a choice to some of the best restaurants in Knysna. Located on the ground floor of the hotel, Zachary’s Bistro offers guests a casual and relaxed all-day dining venue. From decadent breakfast made up of locally sourced cheeses, Charcuterie and the finest hot dishes fresh from the kitchen to superb lunches and dinners (and kiddies meals to match) from our ever changing seasonal menu, Zachary’s Bistro is a relaxed culinary experience, best enjoyed with the entire family. Sip on a delicious cocktail, or unwind with a flute of French Champagne in the tranquility of our chic, laid-back ambience, when visiting Noah’s Champagne and Cocktail Lounge. 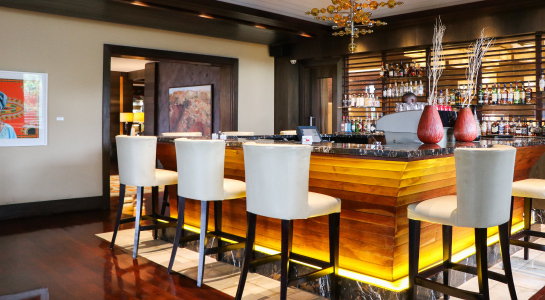 With stylish interiors, a spacious layout and some of the best cocktails and speciality drinks in the area, Noah’s Champagne and Cocktail Lounge offers guests the perfect setting to which to retreat after an active day on the Garden Route. © 2019 Pezula Hotel. All Rights Reserved.